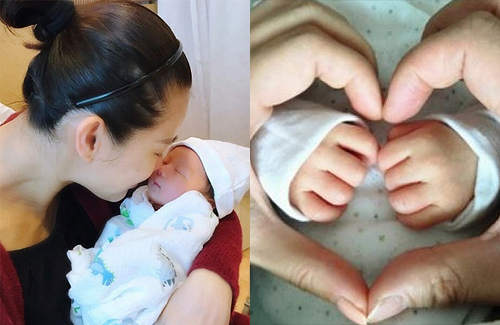 Myolie Wu (胡杏兒) and Philip Lee (李乘德) welcomed the birth of their son, Brendan Lee, last week. Refusing to get an epidural, Myolie gave birth to Brendan experiencing all the pains of labor. Returning home, Myolie is now breastfeeding. The couple chose the name Brendan because it means “prince”. Sharing their excitement via social media, Myolie and Philip have been overwhelmed with happiness with the arrival of their son. Today, Philip uploaded a photo of Myolie cradling Brendan in her arms. Philip expressed his love for his son. Philip was especially moved by Myolie’s sacrifice as a mother. He wrote, “Witnessing her labor, from the moment her water broke, going to hospital, and watching the contractions grow increasingly stronger over the hours from the excruciating expressions on her face – her refusal to take an epidural because she was so determined to feel a mothers sacrifice and love for our child through a natural birth. It was very difficult to stand by feeling helpless and just watch. I will never forget her fortitude. Trust me guys, us men are weak compared to the strength of a mother giving birth! “And after the never ending contraction pain, the actual birth required superhuman strength to push, when there was absolutely nothing left to give, somehow she still found strength to give 100% again and again for nearly an hour. “And now with physical pain all over the body, and breastfeeding, which does not allow Mummy to sleep and recover when she needs it the most. The immense pain and tiredness of full breastfeeding is so underestimated, and the mental determination to go through another cycle of physical suffering is just……humbling. I follow Philip’s instagram and I gotta say this guy is totally in love with Myolie. He constantly talks about her, give her praises, appreciate everything she does. What he said in this article actually makes me tear up. I wish more men appreciate the pain the women goes through during childbirth, both physically and mentally. Congrats to Philip and Myolie! Baby Brendan is so cute. He will be very handsome in the future since he has such good genes. Baby is super adorable!!!! Super happy for her and her hubby as she always seem to want children. Natural birth! Crazy but good for her!!! With all these celebrity having scheduled csection it’s nice to see someone trying a vaginal birth and with no epidural! It’s pretty amazing! Giving birth is hard and breast feeding is unbearable sometime, but it’s worth it. But a full baby is everything even if not breast feeding, it’s OK.
Congratulations and what a sweet message from the hubby. Love it! I don’t understand the masochistic appeal of having natural childbirth without epidural *shudders,* but maybe by bearing the full brunt of labor, myolie feels more like a warrior. I only think that there are ways to declare love for one’s children without resorting to doing this, but i am probably in the minority. congrats to myolie; she’s a brave one! @coralie your body is suppose to recover faster with no epidural but I’m with you. Give me epidural!!! @coralie i am shivering just thinking of the contractions without epidural. the full brunt of labour pain is really no joke. i had epidural twice. there are many ways to love our kids and there is no need to go without epidural…during the inital stage of breastfeeding, there is constant pain due to blocked ducts and engorgement. @happybi – i didn’t know not having an epidural makes recovery faster lol…but still, eck! @coralie Yeah epidural is suppose to make things numb so some Mom feel having it will limit their feeling of pushing. So they feel it will prolong the birth and epidural will stay in your body for a few hours so things will be numb until it’s out of your body. Child birth is very hard but having to breastfeed after is honestly even harder! And when you stop breast feeding, it’s extremely painful for a few days! I remembering getting a fever the first time i stopped breast feeding after 10 months as it was so painful. @coralie Not going to lie.. first 6 months will be tough, so if you can get help from your parents or inlaw, take it!!!! They may drive you crazy but at least you can sleep in a little, take a shower and eat a good meal!! Also please remember a “fed” baby is always good no matter from formula or breast milk. So don’t let them push you in breast feeding if it is not working out. You can always pump and feed in bottle too! But it’s really worth it.. they are super precious…Wishing you the best of luck next year with your planning! SwMyolie’s son is very cute. It is so nice to see her so happy. Congrats to the family of three. It is amazing to see all the families in the Chinese, Taiwanese ebiz so proud of their little ones that they are pleased to let the public see their little ones. Even Mike He and Andy Lau of all people are showing their little girls to the world. Angelababy would do just about anything to add to her fifteen minutes of (why in the world is she famous?) fame.That goes for her equally shallow husband too. Where ares her baby pixs. I have my doubts about her ‘pregnancy’, and if the pregnancy was real, where is the baby? Is it because the child look different than her and hubby?. Well, we know those two are the queen and king of plastic. Parents can become gorgeous by plastic means but, the child will not have the gorgeous look. We can’t change hard facts. We can’t change DNA. Just saying. Makes me wonder as to why this fame and photo hungry couple has not shown their bundle of joy. @bubbletea there are also Aaron Kwok and Ruby Lin who haven’t show their kid to the world yet either. I’m sure lots of us are wondering how they looked like too but too bad they don’t want to show their kid to the world. Anyway congratulations to them. R@cutie777 Yeah, they have not shown their kids to thr public, that is true. However, Aaron and Ruby are very private so that can be expected. Even Andy and Mike He are full of recent surprises. Mike He was even seen at the airport with his wife recently and posted pics of cute Meibao. Andy posted a photo of his dsughter with him and let fans photographed her and Carol with him at a fan meeting. You don’t get more tight lipped than these two. I am shocked that that fame ..ore Angelababy and her equally fame wh.re husband has not posted a photo yet. I know I am not the only one wondering. @bubbletea I think Andy are more private because I heard he’s been hiding his wife for a very long time before he decided introducing her to the world. I think the reason Angela are being famous because of her husband? I’m not too familiar with Mike so not too sure what’s his story behind. Speaking of Ruby, Aaron and Angela kid we don’t even know their name yet still. Can you believe it? @cutie777 okay, I don’t think you quite get it. I am saying that Andy and Mike are insanely private men and yet they, of all people posted pics of their children. Angelababy is a fame trollop. I am just wondering if the child looks like her before all her work was done. We all know she was the beast before she became beauty. @bubbletea There’s really no need to drag Angelababy into Myolie’s happy news. While it’s true that Angelababy and Huangxiaoming are more showy than others, maybe they know how hard it is to constantly be stalked by the paparazzi so they want their kids to grow up in normal environment. Maybe they will introduce the kid when he or she is older. Maybe they have too many enemies and are afraid of kidnapping. Lots of possibilities. Parents have different ways of treating their kids. Just because they don’t show their kids in public doesn’t mean the kid is ugly or is not theirs. So happy for Myolie that Philip is such a lovely husband. Congratz to the family.